Today marks 59 years since 69 people were killed by police in South Africa while attending a peaceful demonstration against Apartheid Pass Laws. Every year since March 21, 1960, the United Nations has declared a theme for the world to reflect on while commemorating and taking action on racial discrimination in society. This year the theme is: Mitigating and Countering Rising Nationalist Populism and Extreme Supremacist Ideologies. Left unchallenged, dangerous racist narratives espoused by politicians and officials around the world encourage citizens to rally around racist ideals. Canada and the United States are not immune. The words that people in leadership positions use matter, and are a critical part of creating cultural norms around how we treat each other in society. 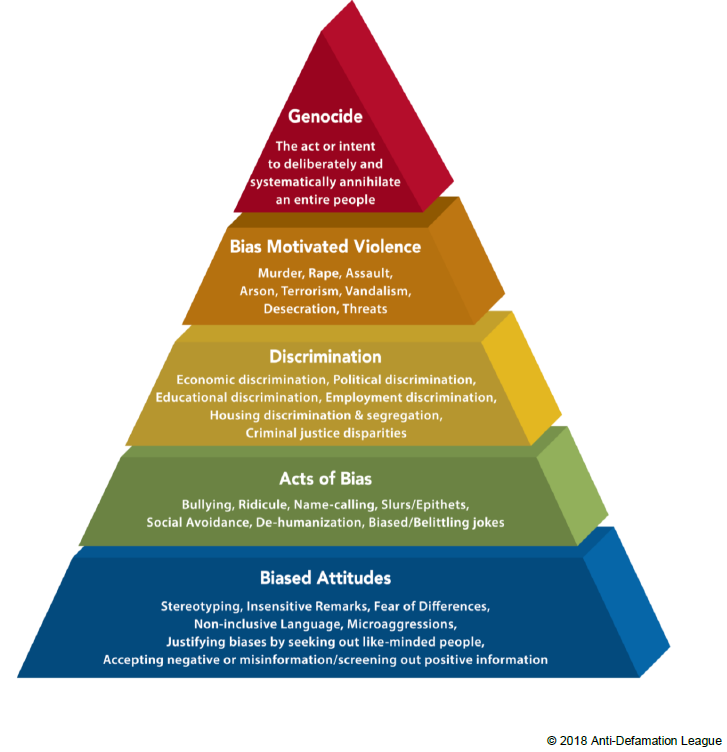 The Pyramid of Hate, an educational tool used by the Anti-Defamation League, shows five steps of prejudice beginning with actions like biased attitudes and non-inclusive language, then building through acts of bias, including racial slurs and avoidance, followed by heightened actions like housing discrimination and other forms of structural violence, with the potential to end in Genocide. What is particularly dangerous about the rhetoric of some politicians is that they walk the level of violence to the third and sometimes even the fourth levels of the pyramid of hate, inciting violence against certain members of our communities. As a movement of working people, we must be mindful of the effect words can have, and be committed through internal and external education to interrupt the stages of progression outlined in the pyramid of hate. One of the most effective ways of mitigating the effects of prejudice on racialized communities is a union collective agreement with language that prevents bullying, harassment and racism in the workplace, followed by good public policy that closes the door on discrimination. The labour movement is committed to protecting all workers. Together, we can change the culture of fear and prejudice into one of inclusion and power.